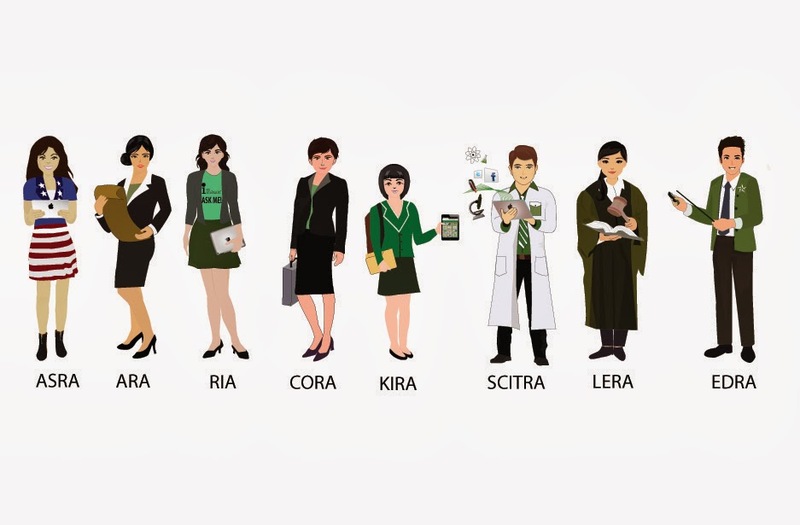 In November 2013, the DLSU Libraries launched the League of Information Assistants (LIA), virtual subject librarians of different satellite libraries or sections of the Learning Commons. Library patrons may connect with LIA for real time online help for discipline - and course-specific research assistance during library opening hours. 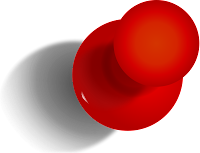 Through chat reference facility, LIA answers ready-reference and research questions and provides online bibliographic and technology instruction. As such, LIA will not answer questions related to: (a) computer configuration, maintenance, and troubleshooting; (b) provision of investment, legal, or medical advice; (c) tutoring or homework help; and, (d) job interview preparation. The trial access to Business Monitor International (BMI) is now available until 31 December 2013. Business Monitor International (BMI) is a leading source of market intelligence encompassing Country Risk, Financial Markets and Industry Research. It combines cutting-edge fundamental views formulated through in-depth assessment of country risk, with innovative technical analysis to forecast movements and set specific price targets for market instruments across asset classes. When you have tried Business Monitor International (BMI), please click and accomplish this Online Feedback Form (indicate BMI in the 'Name of online article/journal/ebook database and/or tool' field). Your feedback/recommendations/comments will truly be helpful in deciding whether or not the Libraries shall subscribe to this database. Thank you. 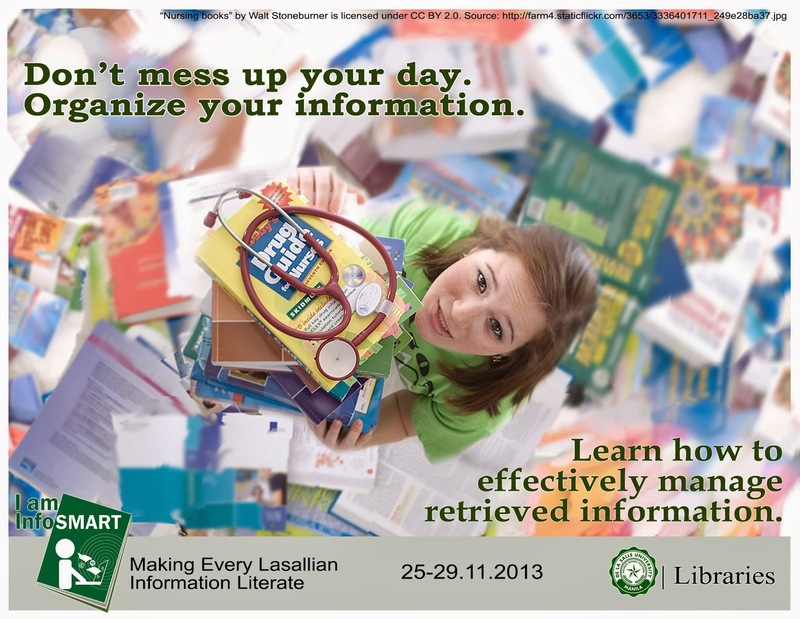 One of the activities conducted in the Libraries’ “IamInfoSMART” campaign last November was the on-the-spot poster-making contest using the theme of “Making Every LaSallian Information Literate”, held on 28 November, 2013 at the 6th floor lobby of the The Learning Commons, Henry Sy, Sr. Hall. 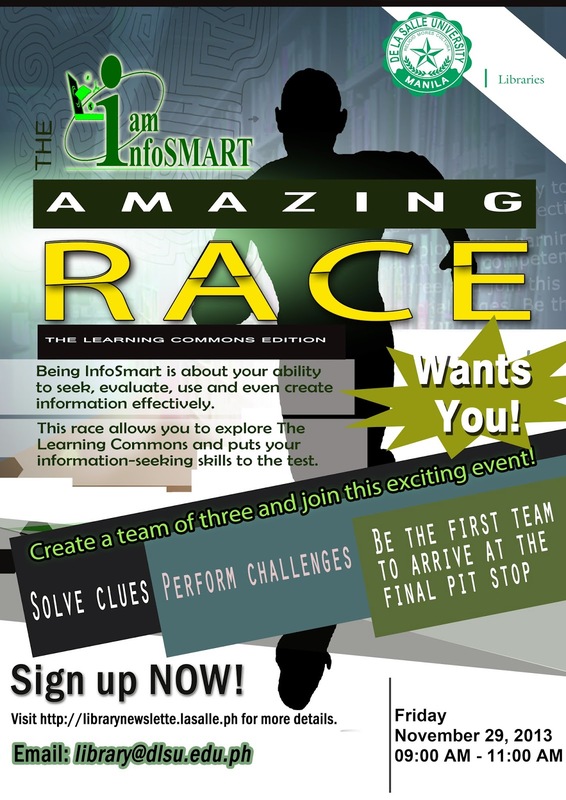 Said contest aims not only to increase students’ awareness on the importance of information literacy as a vital component of lifelong learning, also it seek to consolidate and showcase students’ understanding of information literacy through creative arts. There were seven students who participated in the on-the-spot poster-making contest, namely Ms. Suzana Chimelle Resar (COE); Ms. Dejeannie Tieng (COE); Shera Marie Pausang (COS); Mr. Abdul Jhariel Osman (CED); Mr. Basil Andres (CLA); Ms. Regina Riyal Rafael (CED); and Ms. Marnel Rae Castillo (COS). The board of judges consisted of the Libraries’ Ms. Christine Abrigo, Assistant Director for Operations, Mr. Perseus Rex Molina, Assistant Director for Support Services, and Ms. Marian Eclevia, Reader Services, Coordinator. 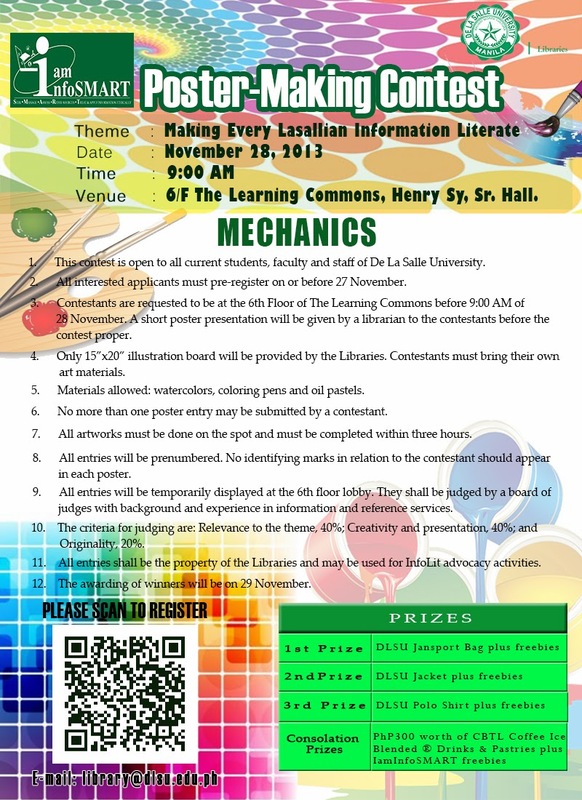 Entries of participants were judged by relevance to the theme, creativity, presentation and originality. Three winners were announced the following day, 29th November 2013 at the 6th floor lobby of the The Learning Commons, Henry Sy, Sr. Hall. The 1st Place went to Mr. Abdul Jhariel Osman, College of Education; 2nd Place Ms. Regina Riyal Rafael, College of Education; and 3rd Place Ms. Marnel Rae Castillo, College of Science. 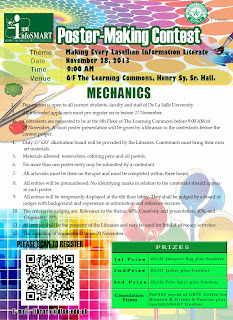 All three poster entries including the non-winning entries may be used for future activities involving Information Literacy advocacy. 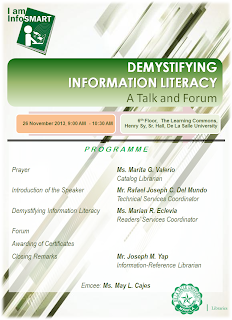 As part of the IamInfoSMART campaign of “Making Every Lasallian Information Literate”, The Libraries conducted a forum entitled “Demystifying Information Literacy” last 26 November 2013 at the 6th floor lobby of The Learning Commons, Henry Sy, Sr. Hall. The resource speaker was no less than Ms. Marian R. Eclevia, Coordinator for Readers’ Services of the DLSU Libraries, who has more than a decade of experience in the field of reference and information service. 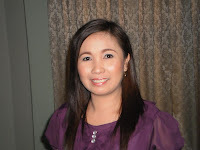 She has earned her Bachelor and Master’s degrees in Library and Information Science from the University of the Philippines. 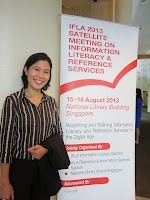 Ms. Eclevia began her lecture by defining information literacy and its importance and relation to lifelong learning. 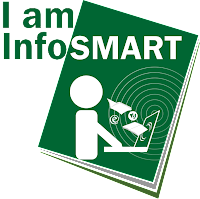 She then discussed the information literacy cycle, which is a series of steps involving (1) defining questions; (2) identifying sources; (3) searching information; (4) locating information sources; (5) evaluating information; and (6) using and sharing information. After delving into each step, Ms. Eclevia gave a short quiz so that the participants can assess their information literacy skills themselves. 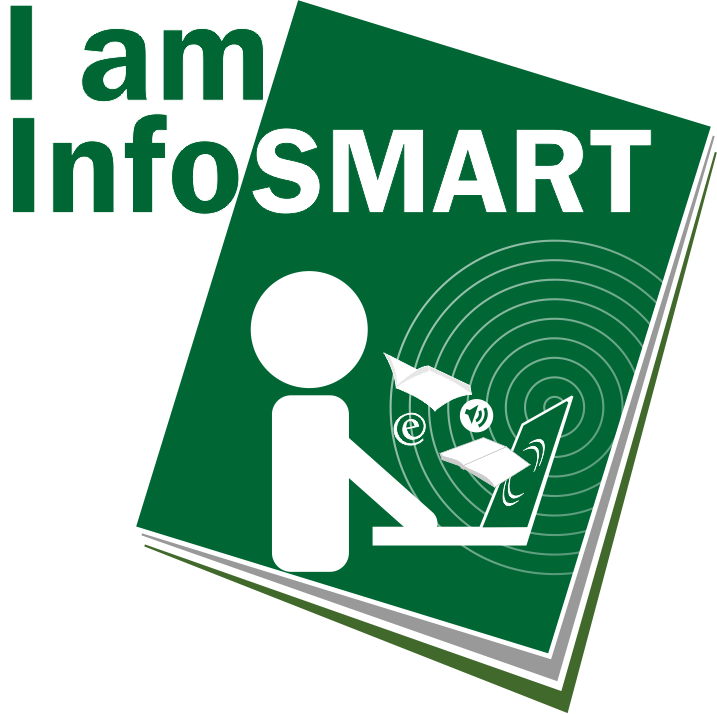 The six skills that were assessed relate to the six steps in the information literacy cycle. The scores garnered in the quiz showed that two of them were in the advanced level. Most of them were proficient, few were novice and no person fell under the not-evident level. There was a short question-and-answer forum regarding the talk afterwards. Aside from DLSU students and staff, many attendees of the free forum belonged to nearby universities like UP-Manila, FEU-Manila and Sta. Clara Parochial School. There are also some who came from the provinces close to Manila. All participants received a treat and snack from the organizers as well as certificate of participation. After this interactive event, they went forth inspired to be more fulfilled information-literate life-long learners. The Libraries would like to remind all undergraduate and graduate students that the deadline for settlement of clearances for Term 2 of AY 2013-14 is on 11 November 2013 (Monday). Please login to your MyLasalle account at (https://my.dlsu.edu.ph/) to check for any accountability. Visit any of the Libraries – The Learning Commons, AGH-Law, and BBLRC at the Manila campus and the satellite libraries at MEC, OEC, and STC – if you have unsettled fines or service fees. 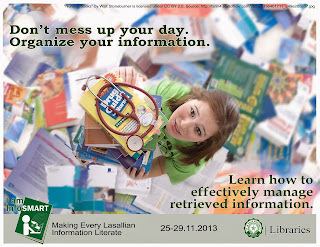 For questions and inquiries, please contact local 620 or send an email to library[at]dlsu.edu.ph. Thank you. Wiley–Blackwell invites the academic community to embark on the Research Discovery Quiz and start connecting research in the global digital environment. 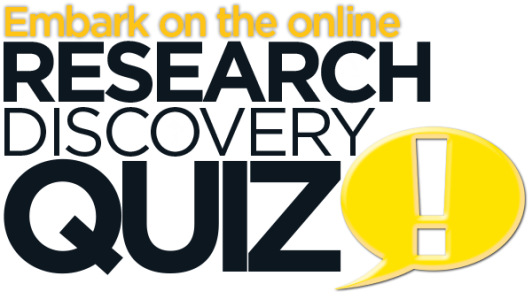 The online quiz is aimed at easing users from their research and studies by familiarizing them with the contents, features, and functionalities of Wiley Online Library. It consists of eight (8) questions and will take no more than 20 minutes to complete. Entries with all questions answered correctly will enter the lucky draw. To join the contest, please go to http://wileyonlinelibrary.com/go/RDQ13. The contest is open to all users in Asia-Pacific Region and will run until 15 December 2013. Terms and conditions apply. Thank you. 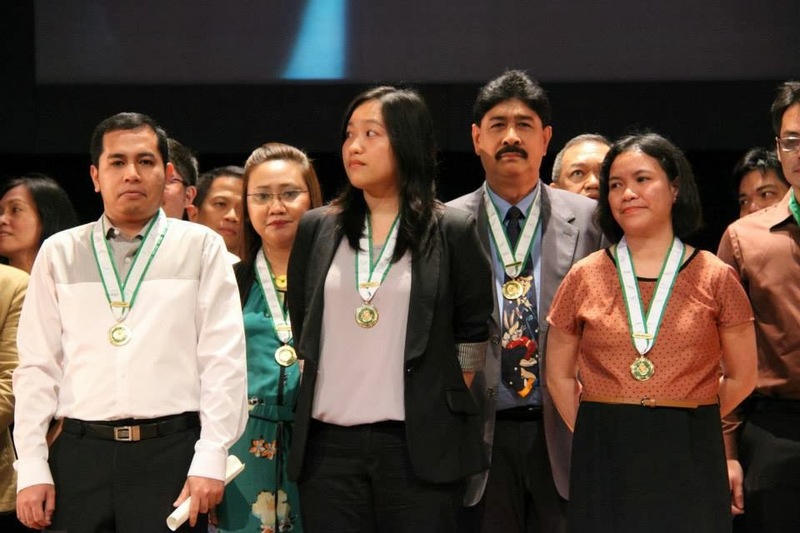 As the university celebrates the National Teachers' Month and the World Teachers' Day, Lasallian educators were honored last October 1, 2013 at this year's Annual Pillar of Lasallian Excellence Awards held at the Teresa Yuchengco Auditorium. Dr. Alfredo Robles of the College of Liberal Arts is this year's Metrobank Outstanding Teacher Awardee. He delivered the keynote speech, ushering in the awards proper. 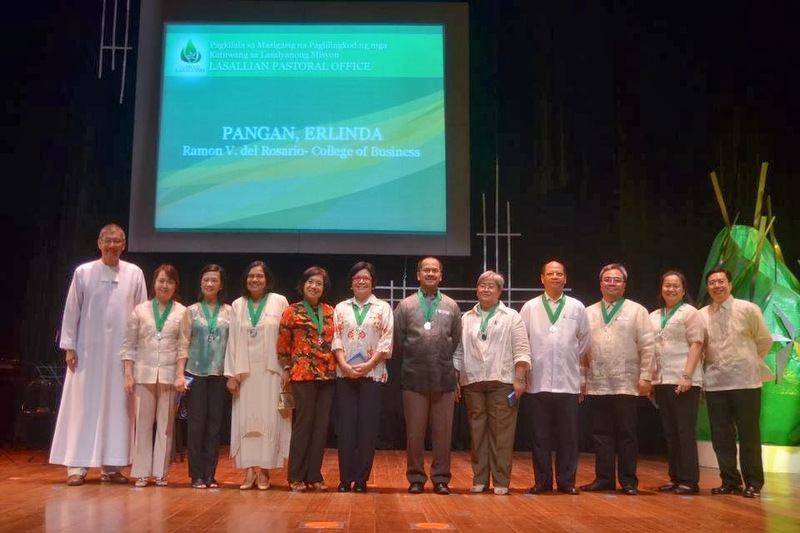 Twenty-two (22) Pillar Achievers received their faculty medals during the awarding ceremony. Pillar Achievers are permanent faculty members who have been promoted in rank as Academic Service Faculty (ASF) II, Assistant Professor, Associate Professor and Full Professor, respectively. Two out of four ASF II awardees are our very own from the Libraries: Ms. Christine M. Abrigo, Assistant Director for Operations, and Mr. Joseph M. Yap, Associate Information-Reference Librarian. On September 12, 2013, another distinguished collection was formally turned over to the De La Salle University Libraries. The Justice Teodoro R. Padilla Collection, consisting mostly of notable out-of-print law books, most of which were perhaps used during Justice Padilla's days as a law student in UP and Harvard University. Some noteworthy titles were The Rule of Law, Nazi Conspiracy and Aggression, Rules of Court in the Philippines and the Nuremberg Trials. The collection distinctly speaks well of Justice Padilla's life as a Justice as most of the materials were used as sources in some of the significant cases that he handled. His collection also includes memorabilia which, as a whole, deserves a spot at the Libraries' Special Collections floor. In a short program, Ms. Ana Maria B. Fresnido, Director of Libraries, expressed her sincerest thanks to the Padilla family for entrusting the donation to the Libraries. Mr. Rafael Joseph C. del Mundo, Coordinator for Technical Services, shared an in-depth look into the said collection. Consequently, Atty. Sabino Padilla IV, son of the late Justice Teodoro R. Padilla, delivered the remarks of circumstance and vividly shared colorful stories he has about his father – his life as a Lasallian, him being a good Justice and how a loving, hands-on father he was. He later on expressed his thanks to the library team for welcoming his father’s valuable collection to DLSU. Notably present during the formal signing and ceremonial turnover to support the Padilla family – Mrs. Louise Ellen B. Padilla with her sons and daughter, Dr. Ma. Dominga Padilla-Lopez, Atty. Sabino Padilla IV and Mr. Teodoro B. Padilla – were: DLSU President and Chancellor, Br. Ricardo P. Laguda, who gratefully received the donation in behalf of the University and gave, good humoredly, a "Green Star" to Atty. Sabino Padilla IV; Dr. Leonila C. Abella, DLSU Associate Vice President for Information Resource Management; Br. Vic Franco FSC, Atty. Jose Manuel Diokno, Dean, DLSU College of Law and other friends and guests of the Padilla family. The recently turned over Justice Teodoro R. Padilla collection is truly worth the keep. 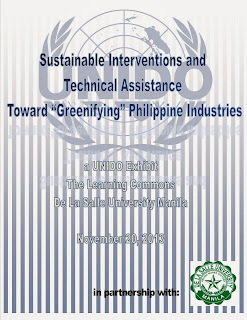 Its value is something that will be very useful to scholars and to the rest of the Filipino people. The items found in this collection are regarded to be reliable sources of information that will benefit legal researchers and future lawyers of the nation. This significant collection also reflects the legacy that Justice Padilla had imparted and will continue to impart to many. 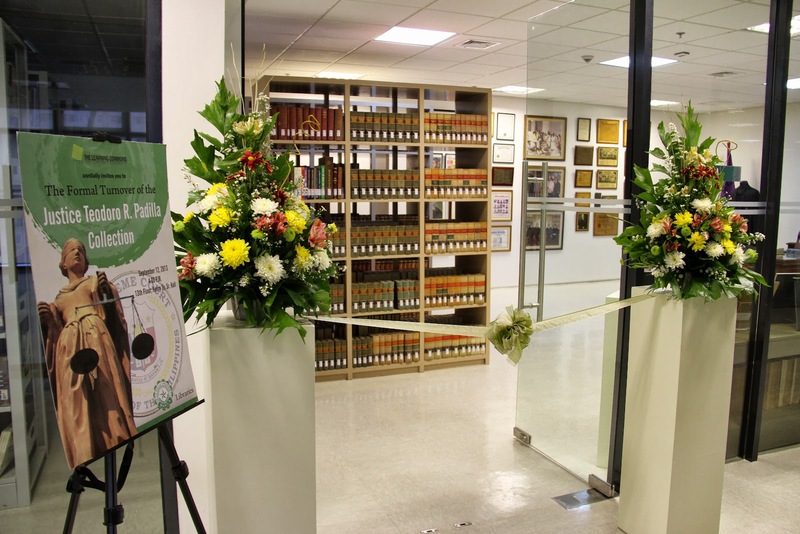 The Justice Teodoro R. Padilla room is located at the 13th floor of The Learning Commons, Henry Sy, Sr. Hall. 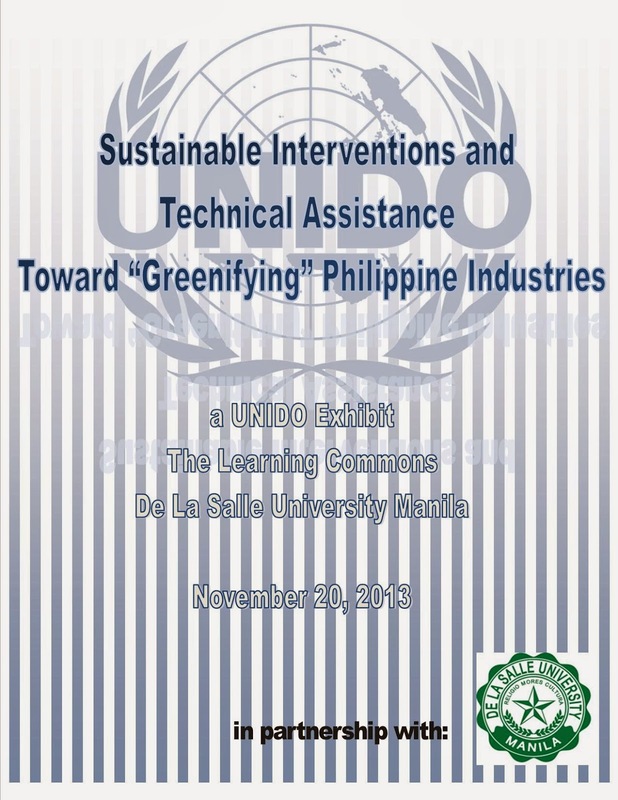 Last August 30, 2013, the De La Salle University Office of the Dean of Student Affairs (DSA) held the Gawad Lasalyano 2013 at the Teresa G. Yuchengo Museum. Now in its second year, the Gawad Lasalyano aims to give recognition to outstanding individuals who uphold excellence in the field of leadership and community engagement. 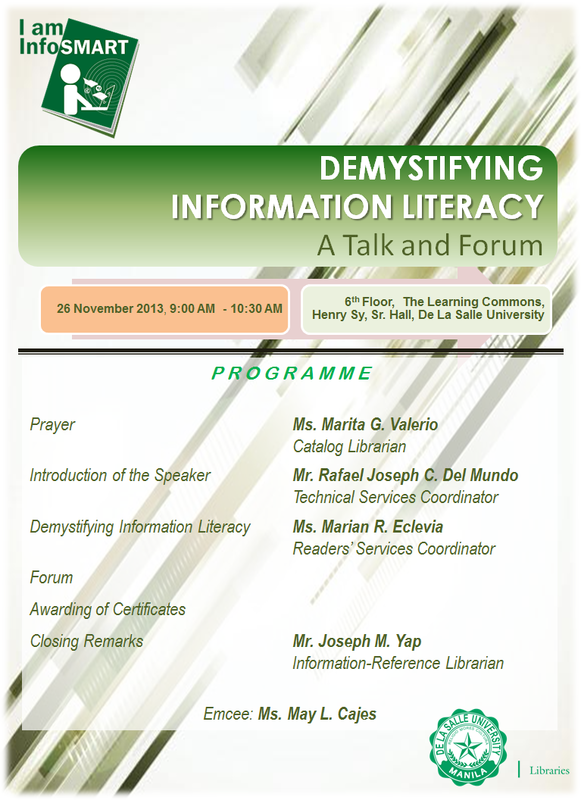 The DLSU Libraries is very honoured to have several of its personnel to receive the Gawad Br. Cecilio Hojilla FSC. The said award is specifically given to outstanding Lasallian mission partners who voluntarily serve as formator by sharing their time, talent and treasure to support and contribute in the propagation of the Lasallian values. 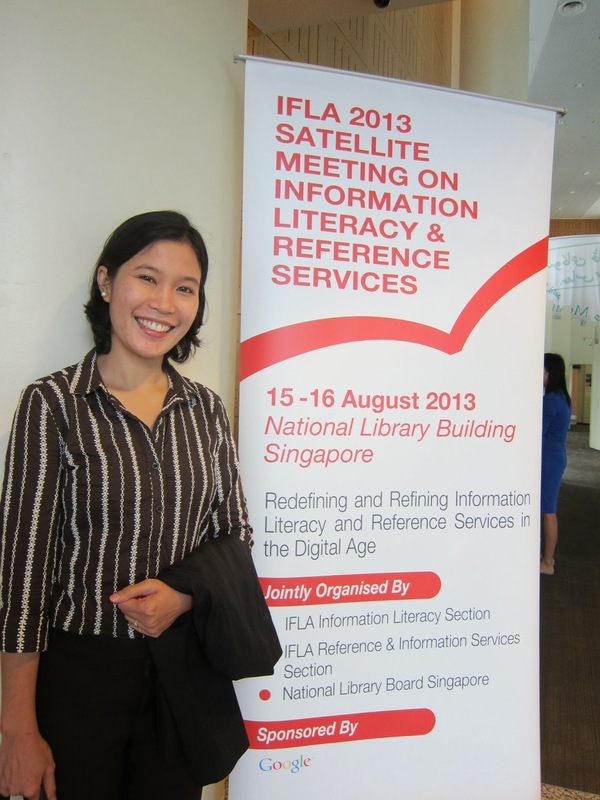 Three DLSU librarians joined the 79th IFLA World Library and Information Congress 2013 held in Singapore last August 2013. 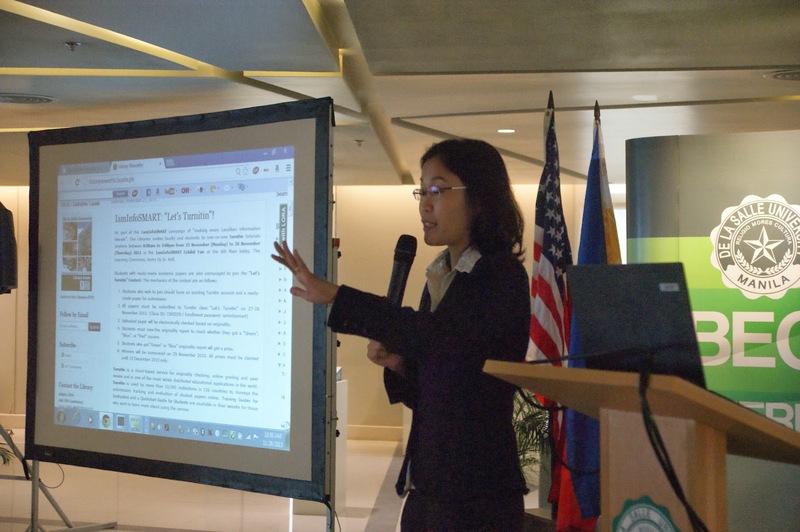 They are Marian R. Eclevia and Laurence G. Narvaez who presented papers in a satellite meeting and Joanna O. Siapno who participated in the main conference. “The International Federation of Library Associations and Institutions (IFLA) is the leading international body representing the interests of library and information services and their users.” (http://www.ifla.org/about) The World Library and Information Congress (WLIC) is organized by IFLA annually in different parts of the world to showcase and discuss the current trends and advancements in the library profession and to give opportunities to the participants for career advancement and to broaden their network. The IFLA WLIC is the international flagship professional and trade event for the library and information services sector. The Green Spine Book Fair, now on its second year, is an activity organized by De La Salle University Libraries and is envisioned as an annual major event to be held every August. This year’s Book Fair activity with the theme “The Libraries = S.P.A.C.E (Shaping Possibilities for Access, Collaboration, and Education)” is quite special since the main university library, now called The Learning Commons, is celebrating this year's Green Spine in its new home at the Henry Sy, Sr. Hall. The Book Fair primarily aims to promote the culture of reading for better education and self-empowerment by bringing the books closer to the academic community. 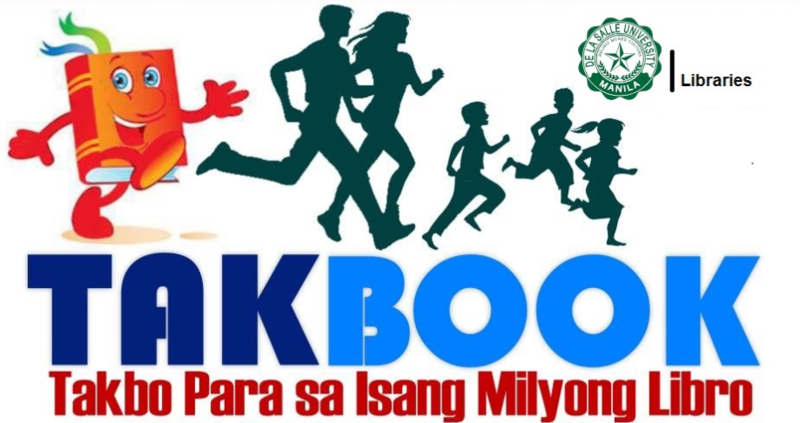 The Green Spine 2013 also endeavors to support the Turn 1 into a Million book drive project of the Libraries. During the 3-day event, apart from great finds of books and other library materials, the Green Spine 2013 also highlighted activities to further promote the Libraries such as: Like Us and Win - passers-by/DLSU Library users/visitors were invited to like or follow The Libraries' social media pages (in Facebook and Twitter) and play to win different prizes; and Board Game Mania – a marketing campaign composed of different activities each day of the Fair to encourage playing of board games in The Learning Commons through game demonstrations amongst students/faculty/staff, like Taboo, FUNglish, Battleship, Game of the Generals, Last Words, etc. There were also book-signing and lectures during the Fair. Survive and Thrive: Marketing Ideas for Libraries was presented by Ms. Janice Penaflor; From Tablet to Tablet: a Symposium was organized by DLSU Publishing House; Ms. Milagros S. Ong, on the other hand, gave a book talk on Legal Research and Legal Citations in the Philippines and Ms. Zarah Gagatiga talked about Writing and Publishing Children’s Books. Both authors graciously signed copies of their books at the end of their lectures. Accessing information today comes in many different ways, thanks to the ushering in of the digital era. Book fairs may not be too popular for some, but the culture of reading is cultivated by bringing books closer to the DLSU community. 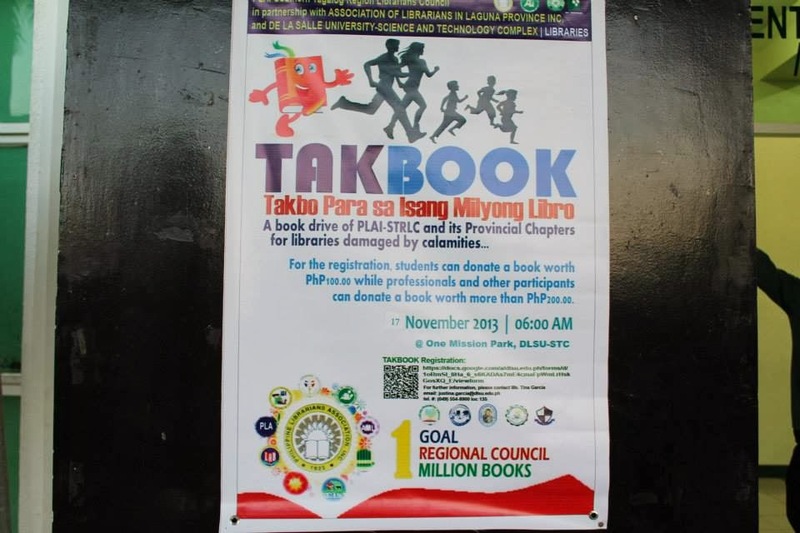 The Libraries are grateful to the community for the success of this activity. Until next year! The DLSU Libraries would like to introduce one of its newest librarian, Ms. Justina P. Garcia. She is currently assigned as the Coordinator of the STC Libraries and at the same time handles the Integrated School Library located at the DLSU-STC Campus in Biñan, Laguna. 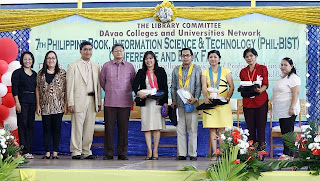 Tina graduated from University of the Philippines School of Library and Information Studies in Diliman. She earned her Bachelor’s Degree in Library and Information Science in 2004 and her Master’s Degree in Library and Information Science in 2009. Mr. Joseph M. Yap, Associate Librarian, Information-Reference, DLSU Libraries and President, Association of Special Libraries of the Philippines (ASLP) gave a presentation on Strategic Planning: Renewing / Reviewing the Association’s Vision. This session is sponsored by DACUN Library Committee under the sub-theme The Library and Information Science Professional : Excellence, Service, and Professionalism (ESP) for National Agenda and Global Realities. Through this conference, the ASLP, with the concerted efforts of its past presidents, current officers and the DACUN library committee paved the way in envisioning the paths to advance the future of special librarians in the country. The Goethe-Institut Philippinen opened the exhibition of the German Photo Book Award 2013 with an art talk and ribbon cutting last August 7, 2013 at The Learning Commons, Henry Sy Sr. Hall, De La Salle University. The opening ceremony featured a lecture on New Philippine Photography which was presented by Mr. Estan Cabigas, a professional photographer and a well-known travel blogger. Also, Dr. Petra Raymond and Ms. Alicia Paraiso of the Goethe-Institut shared the stage to provide the audience some interesting facts regarding the exhibit. On the other hand, the ribbon cutting ceremony was lead by Mr. Edwin P. Santiago, Vice President for Administration of DLSU and Dr. Petra Raymond, Director of Goethe-Institut. The German Photo Book Award is being given annually by the Association of Publishers and Booksellers in Baden-Wuerttemberg, Germany. The Award is divided in three categories, namely: photo/illustrated books, photo-textbooks and photo history/photo theory. Among the criteria being used to evaluate each piece of work are photographic quality, aesthetic overall impression, as well as technical photographic and historic performance. The German Photo Book Award is awarded in three categories: Gold, Silver and Nominee. The exhibit highlights the 5 gold winning titles and 17 silver titles as well as the 170 nominees and will run until the end of August 2013.